Researchers for the first time have identified Earth-sized planets within the habitable zone of a Sun-like star. 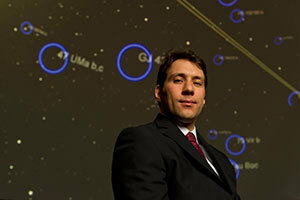 Images of the star taken by University of Notre Dame astrophysicist Justin Crepp rule out alternative explanations of the data, confirming that five planets orbit Kepler-62, with two located in the habitable zone. The results were published in Science magazine today. “A five-planet system with planets of 1.41 and 1.61 Earth-radii in the habitable zone of a K2V star has been detected with the Kepler spacecraft and validated with high statistical confidence,” the paper reports. Those two, named Kepler-62 e and f, are the outermost of the five observed planets and receive a solar flux from the star similar to that received from the Sun by Venus and Mars. Their size suggests that they are either rocky, like Earth, or composed mostly of solid water. A planet discovered more than a year ago in the habitable zone of another Sun-like star, Kepler-22, has a radius 2.4 times the radius of Earth, leaving researchers less sure of its composition. Originally published by Gene Stowe and Marissa Gebhard at news.nd.edu on April 18, 2013.